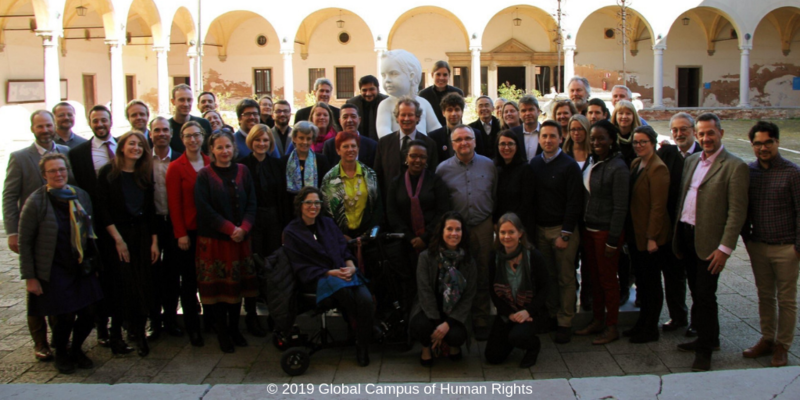 The final Experts meeting for the United Nations Global Study on Children Deprived of Liberty was held at the Global Campus of Human Rights in Venice, Italy from March 11th – 13th included. Representatives from the Advisory Board, research groups, the NGO Panel, and the UN Inter-Agency Task Force attended three full days of meetings covering each of the pillars of the Study: children deprived of liberty in the administration of justice; children living in places of detention with their parents; children deprived of liberty for migration-related reasons; children deprived of liberty in institutions; children deprived of liberty related to armed conflict and children deprived of liberty for national security reasons. The cross-cutting themes of the impact of deprivation on liberty on children’s health, gender, children with disabilities, and children’s experiences of deprivation of liberty were discussed as well as over-arching topics such as the legal framework, conclusions and recommendations, and follow-up to the Study. The Global Study will be finalized in the coming months and the report will be delivered to the UN General Assembly in October 2019. On March 5, 2019, the NGO Panel for the United Nations Global on Children Deprived of Liberty delivered a statement during the Interactive Dialogue with Special Representative of the Secretary-General for Children and Armed Conflict. The NGO Panel took the opportunity to thank the Special Representative of the Secretary-General (SRSG) on Children and Armed Conflict and its focus on the abduction of children in armed conflict and children of or recruited as foreign fighters. The NGO Panel called on States to continue to contribute to and support the development of the Study and its follow-up, and to implement its recommendations. 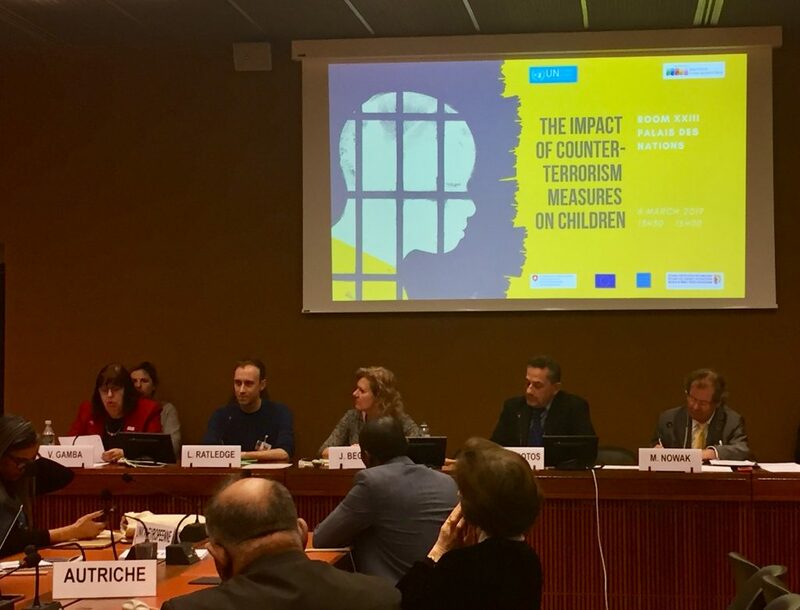 On March 6, 2019, Defence for Children International (DCI), Human Rights Watch (HRW), the Swiss Mission to the United Nations and the European Union delegation to the United Nations co-hosted a side event on the Impact of Counter-Terrorism Measures on Children during the 40th session of the United Nations Human Rights Council. The event was an insightful and vivid discussion on the impact of counter-terrorism measures on children, including their deprivation of liberty. The panel featured Ms. Virginia Gamba, Special Representative of the Secretary-General for Children and Armed Conflict (SRSG), Mr. Leo Ratledge, Legal and Policy Director at Child Rights International Network (CRIN), Ms. Jo Becker, Advocacy Director of the Children’s Rights division at HRW, and Professor Manfred Nowak, Independent Expert leading the United Nations Global Study on Children Deprived of Liberty, with Alex Kamarotos, Executive Director of DCI – International Secretariat as moderator. Alex Kamarotos opened the event by thanking the European Union delegation and the Swiss mission for co-sponsoring the event. He also welcomed all the participants and underlined that 2019 is a landmark year for the Global Study as it will be delivered to the General Assembly in October. The panel opened with the intervention of SRSG Gamba who presented her recent report to the UN Human Rights Council, which included a focus on the abduction of children in armed conflict and children of or recruited as foreign fighters. 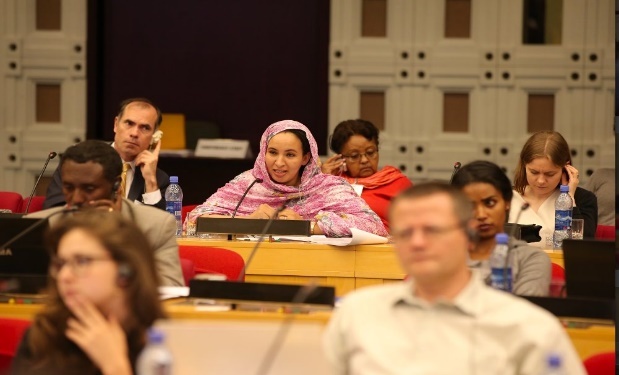 She called on states whose citizens have travelled to join extremist groups to allow them to return following a determination of their best interests and to ensure that no child is left behind nor left stateless. Her message was one of prevention and protection. Leo Ratledge presented CRIN’s recent report “Caught in the Crossfire” about the effect of counter-terrorism legislation on children. He reminded participants that punitive measures are not necessary and that a human rights approach focused on prevention and rehabilitation is far more effective. He called for an approach focused on safeguarding, not criminalisation, including diversion and non-custodial measures. A key moment of the event was the presentation of Jo Becker’s new report “Everyone Must Confess:” Abuses against Children Suspected of ISIS Affiliation in Iraq.” After presenting her findings, Becker reinforced the message that rehabilitation is key. Yet too often governments are taking punitive approaches, treating children as criminals, not victims. She concluded with a call to prosecute child recruiters and to help children with rehabilitation and reintegration. The panellists were followed by an interactive question and answer session. Questions covered country-specific situations queries around the Global Study and its next steps, and topics such as the criminalisation of online activity. For her part, Jo Becker concluded by highlighting that the Study will give states guidance on how to better approach deprivation of liberty from a child rights perspective. SRSG Gamba stressed the importance on the Study and the support of her office for its development. She noted that the Study will help to address the lack of data and information on deprivation of liberty. Leo Ratledge and Professor Nowak responded to questions concerning criminalisation of children on national security grounds for online activity stating that they had seen cases of this. Nowak concluded the event noting that the Study will include recommendations regarding all the different types of deprivation of liberty of children and non-custodial measures. 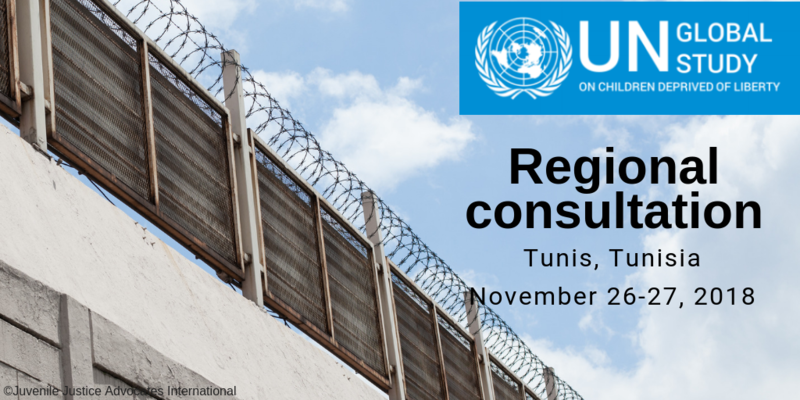 On November 26th – 27th, 2018, a consultation for the Middle East North Africa (MENA) region was held in Tunis, Tunisia. The consultation gathered more than 60 government officials, child rights experts, and civil society representatives from across the region to discuss children deprived of liberty in all the settings addressed in the Study. Professor Manfred Nowak presented the Study and in-depth workshops were held to identify the ways in which children are deprived of their liberty, particular challenges for children in the MENA region, and non-custodial measures. A workshop on children’s consultations and their views on deprivation of liberty was also held. 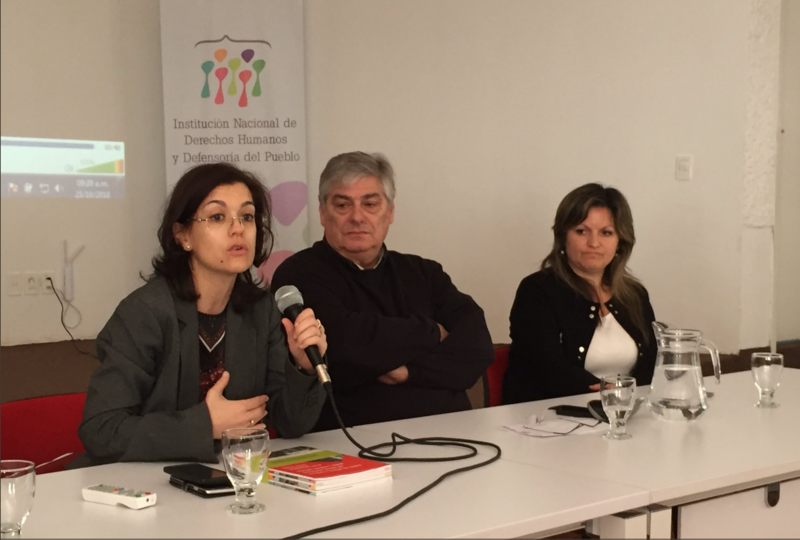 On October 25, 2018, a consultation was held in Montevideo, Uruguay to discuss key themes related to the United Nations Global Study on Children Deprived of Liberty. Civil society representatives from across the region participated in discussions on children deprived of their liberty in the administration of justice, in institutions, and in the context of migration as well as those detained their parents. Professor Manfred Nowak presented the Study via video message and appointed Professor Mary Beloff, member of the Advisory Board and expert in children’s rights and criminal law, to represent the Study. Panellists and participants held vibrant discussions on the rights of the children deprived of their liberty, particular challenges for children in the Latin American region, and the need for non-custodial measures. Dear friends, let me remind you, why it is important that the United Nations Global Study on Children Deprived of Liberty is a success. Deprivation of liberty of children is not merely an issue of international legal obligations not being fulfilled, but it has serious harmful effects on the mental and physical health and development of children and on society at large. Witnessing children behind bars during my time as United Nations Special Rapporteur on Torture was heart-breaking, as many children are tortured, neglected or isolated and crying for help. The youngest victim I met was a three-year-old orphan in a terrifying institution that warehoused boys in a variety of situations and employed daily beatings for minor infractions. Video of delivery of the NGO Panel for the Global Study on Children Deprived of Liberty Statement (02:37:02). A thematic consultation on children deprived of liberty in institutions was held in Pretoria, South Africa from July 26-27, 2018. 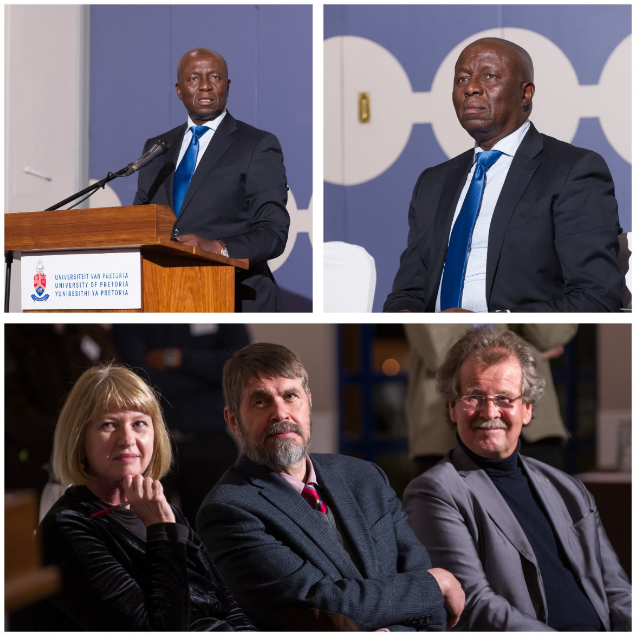 It was hosted by the Centre for Child Law in the Faculty of Law at the University of Pretoria together with UNICEF. The consultation gathered representatives from several international non-governmental organisations such as Defence for Children International (DCI), Hope and Homes, Lumos, Disability Rights International, SOS Children Villages International, the Better Care Network, the Center for Disability Law and Policy as well as UNICEF and the CELCIS Centre of the University of Strathclyde. It featured rich discussions on key topics relevant to children deprived of their liberty in institutions, including definitional challenges, the causes and consequences of such practices and the specific situation of children with disabilities, migrant children, orphans, lesbian, gay, bisexual and intersex children, and children with “behavioural” problems, among others. The discussions from the consultation will feed into the Study and addressed the identification of interesting practices, the need for a de-institutionalisation process, and the recommendations that should be addressed to all stakeholders. On June 26, 2018 — International Day in Support of Victims of Torture — Professor Nowak, the Independent Expert leading the UN Global Study on Children Deprived of Liberty called for countries around the world to complete the questionnaire by counting the number of all children deprived of liberty in different contexts. This aimed at providing a snapshot of the number of children detained at that specific point in time. 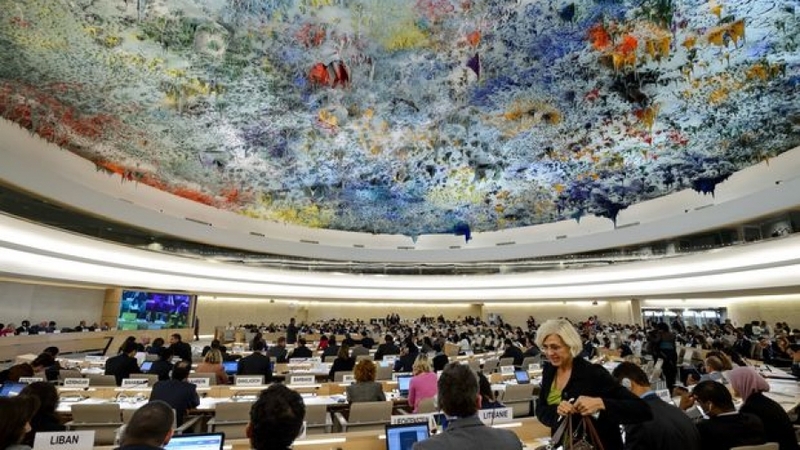 The United Nations Human Rights Council’s (HRC) 38th session took place from June 18 to July 6, 2018 at the Palais des Nations in Geneva, Switzerland. On June 18, 2018, the Special Rapporteur on the right of everyone to the enjoyment of the highest attainable standard of physical and mental health, Mr. Dainius Puras, presented his thematic report on the right to health in the context of confinement and deprivation of liberty, which included a focus on children deprived of liberty. He regretted that, in the 21st century, uncountable millions of children continue to be detained or awaiting trial, highlighting the negative impact that deprivation of liberty has on the right to physical, psychological, mental, and emotional health on children as well as poor sanitation, lack of fresh air and safe drinking water, and physical and sexual abuse by staff and peers. The Special Rapporteur called for the abolition of detention of children, stating that children should only be deprived of their liberty in very exceptional situations. Alternatives to detention, investing in families at risk, helping children to have good skills to live in the community, and involving adolescents in preventive programmes, were some his recommendations. Read a shortened version of his findings here. Defence for Children International (DCI) , on behalf of the NGO Panel for the Global Study on Children Deprived of Liberty, delivered a statement during the interactive dialogue with the Special Rapporteur . The NGO Panel welcomed the Special Rapporteur’s report and called on Member States and observers to engage with the Study, including by answering the questionnaire. The International Catholic Child Bureau (BICE) also delivered a statement welcoming the Special Rapporteur’s reference about the adverse conditions that affect physical and mental health on children deprived of liberty or confined and calling for engagement with the Global Study. 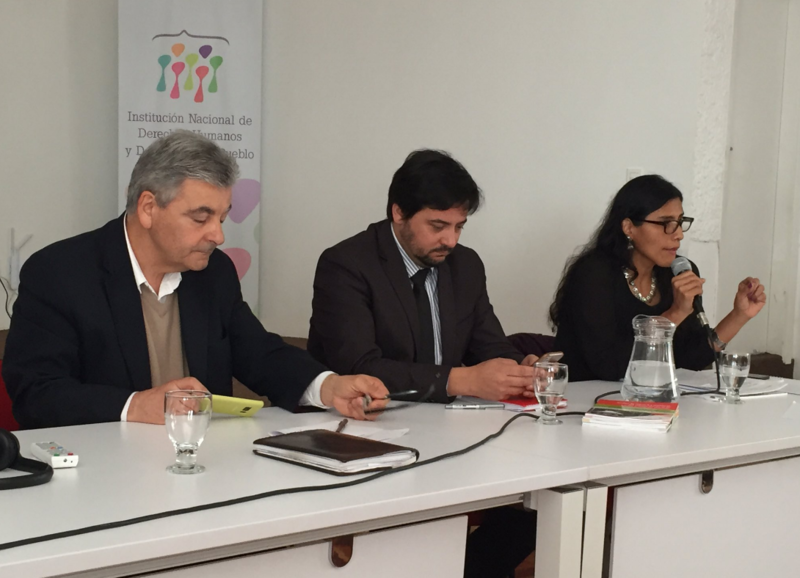 On June 19, Mr. Felipe González Morales, the Special Rapporteur on the human rights of migrants, presented his report on the return and reintegration of migrants. He noted that, under international human rights law, children should never be detained for immigration purposes, nor can detention be justified as being in a child’s best interests. He stated that alternatives to deprivation of liberty must be found, including family-based solutions. Furthermore, he expressed concern about children being separated from their families, especially considering that migrant children in many countries were not being provided with the basic services they needed. During the interactive dialogue with Mr. González Morales, Austria highlighted the lack of information around detention of children including numbers, location, and conditions of detention, and called upon governments to engage with the Global Study, including by answering the official questionnaire and providing relevant quantitative and qualitative data. Expressing similar concerns, UNICEF and several non-governmental organisations, including VIDES and Human Rights Law Centre showed concern regarding the growing number of children being detained, deported, and separated from their families. 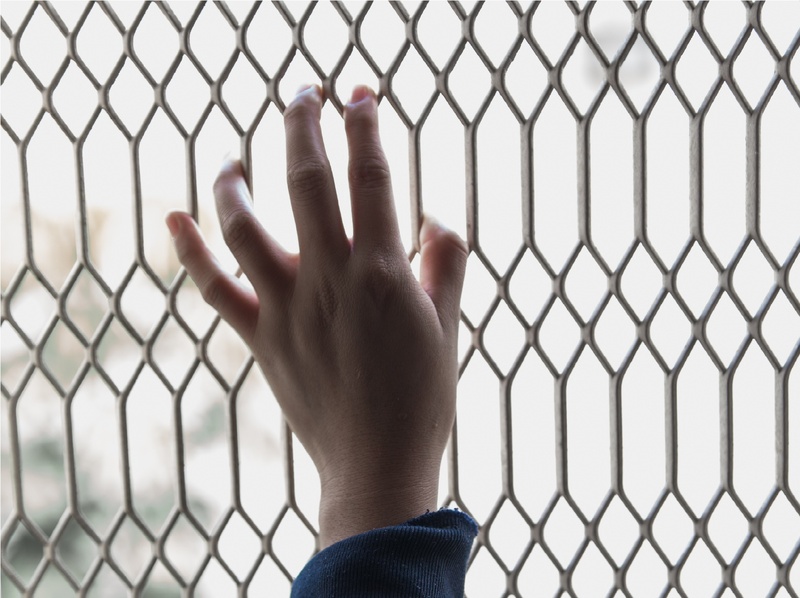 ECPAT International urged member States to support the Global Study, including by providing disaggregated data on boys and girls in detention. The World Congress on Justice for Children took place on May 28-30, 2018 in Paris, France. Three major issues were addressed in the Congress: the global trend towards children’s involvement in violent extremism and possible responses, the need for more effective ways to reduce juvenile offending and recidivism, and how to improve protection mechanisms for vulnerable children, including early prevention. 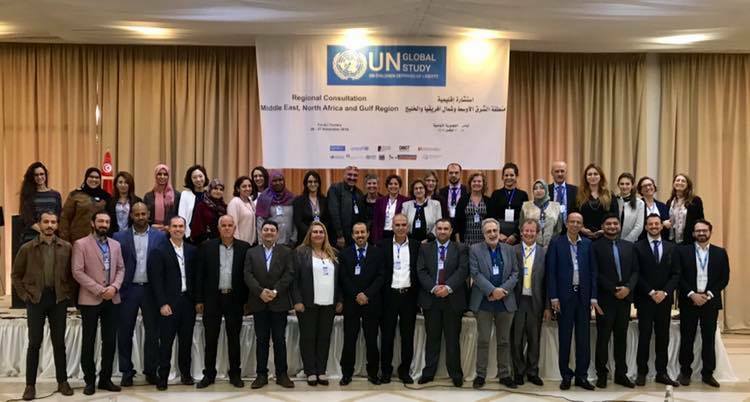 Numerous professionals and stakeholders from all around the world shared their perspectives on youth and family justice and the prevention of offending and violent extremism. A Declaration was adopted as an outcome to the Congress – a call and commitment for all children’s rights defenders to unite and build on the Conference to bring about true justice for all children everywhere and safeguard children from violence, abuse, neglect and exploitation. You can read the Paris Declaration, the outcome of the World Congress on Justice for Children here. 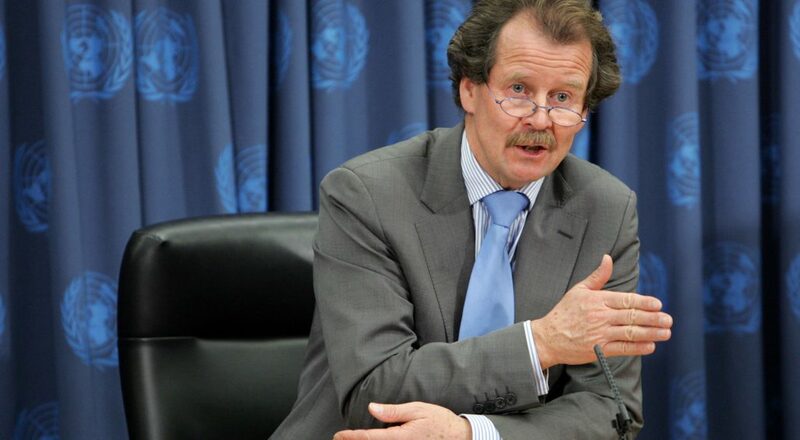 Professor Manfred Nowak was a speaker on the keynote panel, many members of the NGO Panel were speakers and facilitators on different panels and workshops, and various activities and meetings were held in relation with the UN Global Study. Professor Nowak held a briefing session with state representatives on the Study and responding to the Questionnaire. He also met with the NGO Panel to discuss NGO engagement with the Global Study and to respond to questions directly from the Panel. A regional consultation for the United Nations Global Study on Children Deprived of Liberty was held during the Continental Conference on Access to Justice for Children in Africa on May 10, 2018. The conference addressed a range of topics on access to justice for children in different contexts across Africa, several of which involved the deprivation of liberty of children. It also marked the launch of the report, “Spotlighting the Invisible: Justice for Children in Africa, and ended with a Call to Action setting out concrete steps for key actors, including governments, African Union bodies, and civil society. 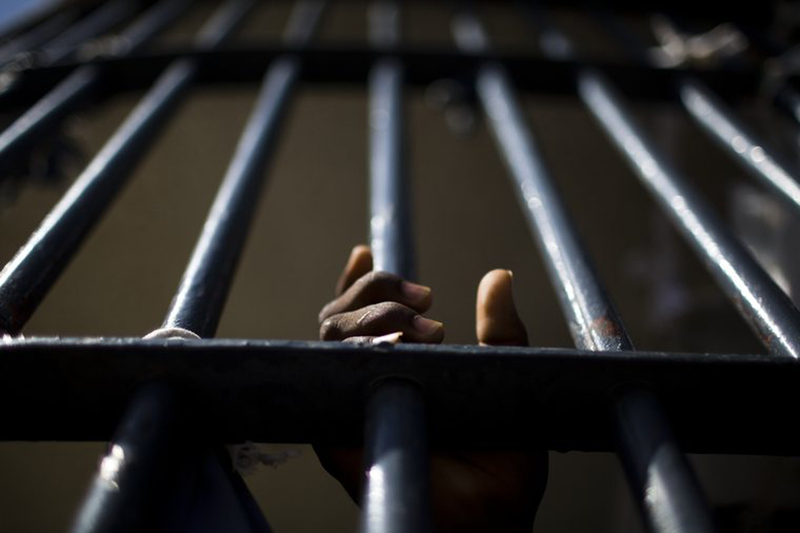 An ASEAN (Association of South East Asian Nations) regional consultation on juvenile justice reform, held in Bangkok, Thailand from May 2-4, was also used as a regional consultation for the Study. Professor Manfred Nowak gave plenary presentations on both the Study as a whole, as well as the questionnaire in particular. Representatives of nearly all research groups were present and led day-long sessions to get input from participants on the Study’s themes. The consultation included government representatives from Myanmar, Cambodia, Indonesia, Singapore, Thailand, and Vietnam, as well as United Nations International Children’s Emergency Fund (UNICEF) country offices and national human rights institutions. 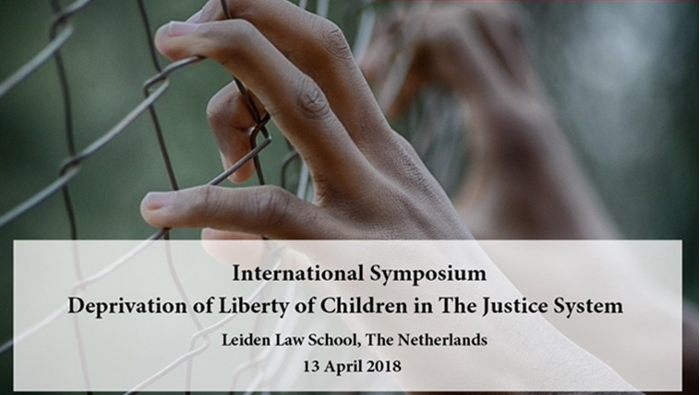 On April 13, 2018, the Child Law department of the Leiden University hosted the international symposium “Deprivation of Liberty of Children in The Justice System – Towards a Global Research Agenda”. The symposium brought together an international and interdisciplinary group of scholars, practitioners, advocates and representatives of non-governmental organisations and governments to exchange research and knowledge about deprivation of liberty of children in the context of juvenile criminal justice. The main aim was to develop a global and interdisciplinary research agenda for the UN Global Study. The Experts and the Advisory Board of the United Nations Global Study met in Vienna, Austria, on April 10-11, 2018. This meeting reflected the new phase of the UN Global Study – implementation. The main outcomes were the appointment and first meeting of the Advisory Board and the finalization and adoption of the research methodology. Cross-cutting issues such as the impact of deprivation on liberty on children’s health, gender, and child participation will also be included in the study. Five research groups were established: children deprived of liberty in the administration of justice; children living in places of detention with their parents; children deprived of liberty for migration-related reasons; children deprived of liberty in institutions; and children deprived of liberty related to armed conflict and national security. Each of these research groups comprises a research institution/academia, a UN focal point, an NGO focal point, and Advisory Board Members. 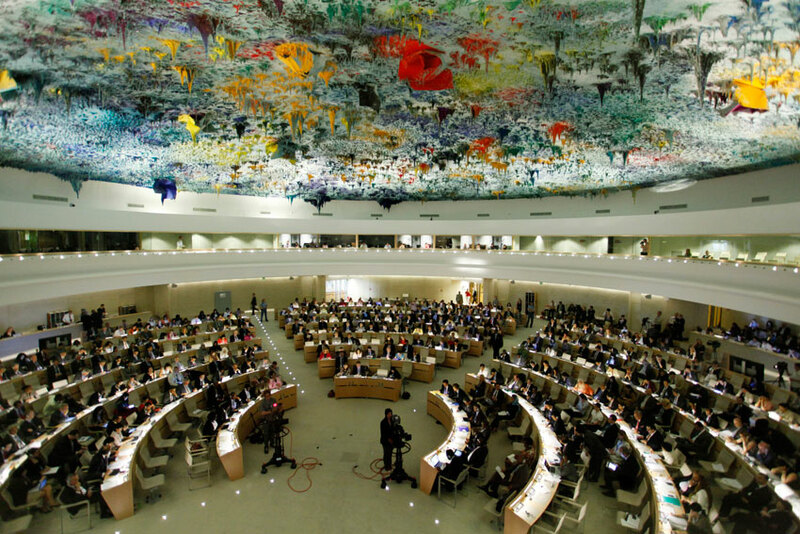 An Expert Level Meeting on the United Nations Global Study on Children Deprived of Liberty was convened during the 37th session of the Human Rights Council in Geneva, Switzerland, on March 8, 2018. The questionnaire sent to governments and other stakeholders in February was presented. Participants also discussed the institutional framework around the UN Global Study and the mobilization of political support and commitments to support the effective implementation of the Study. The NGO Panel also met with the Independent Expert, Professor Nowak, to discuss recent developments and put questions to Professor Nowak concerning the next stages of the Study implementation. The 11th European Forum on the Rights of the Child was held in Brussels (Belgium), on 06-08 November 2017, and focused on alternatives to detention. On the first day, experts and key actors such as Marta Santos Pais (Special Representative to the Secretary General on Violence against Children), Renate Winter (Chairperson of the United Nations Committee on the Rights of the Child), Manfred Nowak (Independent Expert for the Global Study) – among others – gathered to discuss regional and international commitments on children deprived of liberty; personal testimonies were as well shared during the discussions. The second day consisted in four parallel sessions on I. children in conflict with the law, II. detention of children in the context of migration, III. children in institutions and IV. children of parents in prison. Moreover, on the fringes of the EU Forum, a data collection meeting was held with key actors in order to discuss this important component of the Global Study. The meeting was moderated by the Office of the High Commissioner for Human Rights (OHCHR) together with the Independent Expert for the Study, Professor Nowak, and EU representatives participated, as well as relevant UN agencies and NGOs. 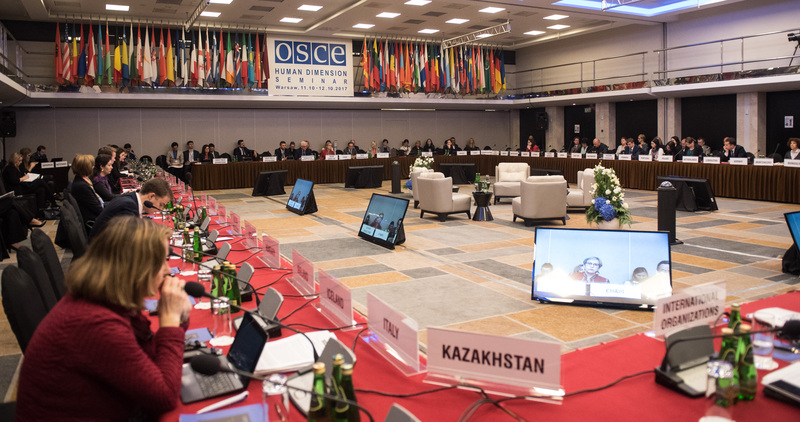 The Independent Expert participated in the Human Dimension Seminar on “Rights of the Child: Children in Situations of Risk” in Warsaw, Poland, on 11-12 October, organized by the Organization for Security and Cooperation in Europe (OSCE). The Seminar included a specific Working Group on children deprived of liberty and three Regional Consultations on the Global Study on Children Deprived of Liberty (I. Children In Conflict with the Law, II. Children In Institutions, III. Children in Migration Detention). Defence for Children International (DCI) and Human Rights Watch (HRW), co-conveners of the NGO Panel, attended this event. On 10 October 2017 the Independent Expert for the Study, Professor Nowak, updated the Third Committee of the United Nations General Assembly (UNGA) in New York. In his speech, the Expert explained that although he received funding from Switzerland, Austria and a private donation, substantive funding was still required to ensure an effective outcome of this important initiative. To this end DCI, as co-convenor of the NGO Panel, prepared an apposite public statement and the Independent Expert a specific OP ED. During the 36th regular session of the United Nations Human Rights Council (11-29 September 2017), the biannual resolution on Human Rights in the Administration of Justice, including Juvenile Justice, was adopted without a vote. DCI actively contributed to the drafting of the text, ensuring child rights principles be included and enhanced, and that the Study be further supported. 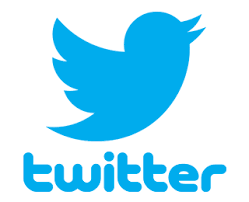 A social media campaign was launched around the United Nations General Assembly (UNGA), and in light of the Independent’s Expert’s brief thereto, to further galvanize support for the Study, in particular financial support to ensure its effective implementation. An expert meeting “Methodology, Data Collection and Way Forward” was held in Venice (Italy), on 13-14 March 2017, to gather key actors involved in the development of the Global Study. The main focus was to review and finalize a draft in-depth questionnaire – a data and information gathering tool to be transmitted to States. During the 34th regular session of the United Nations Human Rights Council (27 February-24 March 2017), the NGO Panel for the Global Study on Children Deprived of Liberty organized a side-event “Implementation of the UN Global Study on Children Deprived of Liberty” (8 March 2017). The event was supported by the Delegation of the European Union and the Permanent Missions of Austria, Chile, Switzerland, and Uruguay to the United Nations in Geneva. This side-event aimed to encourage all stakeholders to contribute and support the implementation of the Study, and discuss the different phases of the Study and its methodology. In light of the United Nations High-Level Plenary meeting on addressing large movements of refugees and migrants (19 September 2016, New York), the NGO Panel made a press release calling upon member States to put an end to the immigration detention of children, and to support the Global Study on Children Deprived of Liberty, which will include a specific thematic cluster on children in immigration detention. Defence for Children International (DCI), as co-convener to the NGO Panel for the Global Study on Children Deprived of Liberty, attended the United Nations General Assembly Special Session (UNGASS) on the World Drug Problem (19-21 April 2016, New York). DCI lobbied around the outcome document (A/S-30/L.1), in order to ensure the rights of the child were positively addressed; also attending the 59th Session of the Commission on Narcotic Drugs (CND) which included the UNGASS Preparatory Session (14-22 March 2016, Vienna). To this end, a joint statement was drafted together with Child Rights International Network (CRIN), Defence for Children International (DCI), International Centre on Human Rights and Drugs Policy (ICHRDP) – University of Essex, International Juvenile Justice Observatory (OIJJ), Consortium for Street Children, NNAPEs – Plataforma Regional por la Defensa de los Derechos de Niñas, Niños y Adolescentes con referentes adultos privados de libertad (Regional Platform for the Protection of the Rights of Children of Incarcerated Adults, and Make Mothers Matter International. During the UNGASS, DCI organized a roundtable discussion with key players (UN agencies, member States, academics and civil society organizations) all working on the issue of children and drugs. The discussions focused on how to address the drug issue and specifically how to prevent children coming into the justice system due to involvement with drugs (drug use, drug production, drug trafficking). DCI successfully lobbied the United Nations Committee on the Rights of the Child to join a statement together with other United Nations mechanisms addressing the world drug problem. The NGO Panel organized a side-event to the 31st regular session of the Human Rights Council on Thursday 10 March 2016, together with the Office of the High Commissioner for Human Rights (OHCHR), the Special Representatives to the Secretary General (SRSGs) on Violence against Children and Children and Armed Conflict, the Special Rapporteur on Torture, the United Nations Office on Drugs and Crime and UNICEF; with the support of the Permanent Missions of Switzerland, Norway, Algeria and Uruguay to the United Nations. The United Nations Deputy Secretary-General, Mr. Jan Eliasson, delivered a video message, stressing that “children who are deprived of liberty fall into a statistical vacuum, with numbers of these children potentially ranging anywhere from the tens of thousands to the millions”. 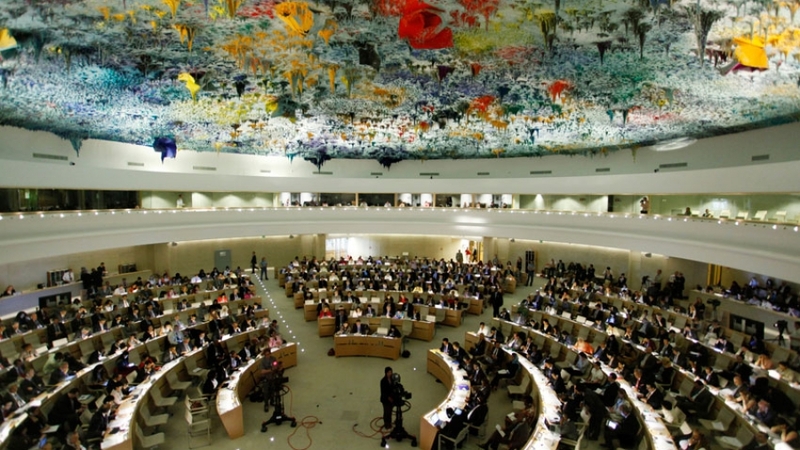 In addition Defence for Children International (DCI), on behalf of the NGO Panel for the Global Study on Children Deprived of Liberty, delivered an oral statement during the 31st regular session of the United Nations Human Rights Council, within the Interactive Dialogue with the United Nations Special Representative on Violence against Children (08 March 2016). The Global Study on Children Deprived of Liberty is formally supported and included in the Council of Europe Strategy for the Rights of the Child (2016 – 2021)by the Committee of Experts on the Council of Europe Strategy for the Rights of the Child (DECS-ENF 2016, section 4.2, paragraph 54). The United Nations General Assembly Resolution on the Rights of the Child (A/RES/70/137, paragraph 54), recalls previous Resolution calling for the Study and encourages member States, United Nations agencies, funds, programmes and offices, as well as other relevant stakeholders to support the elaboration of the Study. On Universal Children’s Day (20 November) the United Nations Secretary General made an official statement explaining the Study and calling on member States to come together to assemble resources to take the study forward. The United Nations Human Rights Council Resolution on Human rights in the administration of justice, including juvenile justice (A/HRC/30/7, paragraph 26) supports the invitation made by the General Assembly to the Secretary-General to commission an in-depth global study on children deprived of liberty. 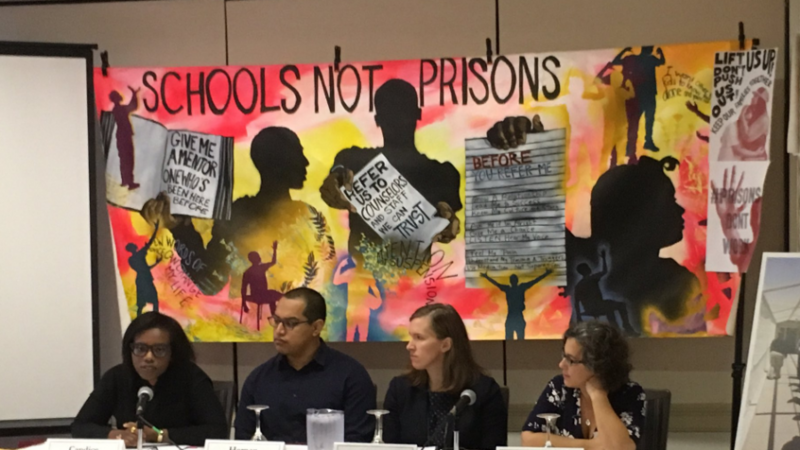 Defence for Children International (DCI) co-organized a side event on “Girls in Detention” (18 June) together with Penal Reform International (PRI) and the Office of the Special Representative to the Secretary General on Violence against Children (O/SRSG/VAC). 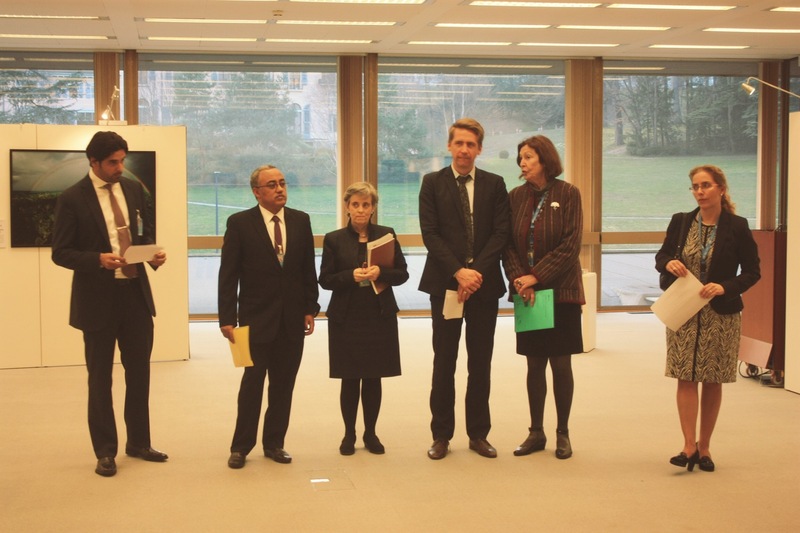 The event was sponsored by the Permanent Mission of Switzerland to the United Nations in Geneva. Panellists included representatives from the Office of the Special Representative to the Secretary General on Violence against Children, the Women Human Rights and Gender Section of the Office of the High Commissioner for Human Rights (OHCHR), as well as representative from Penal Reform International (PRI) and our colleague Vilma Amparo Gomez Pava of DCI – Colombia. The discussions identified the obstacles and challenges which compromise the realisation of girls’ rights in the criminal justice system. Discussions covered how to foster the adoption of gender-responsive policies; establish child-friendly justice systems that are sensitive to girls’ particular needs; set effective complaints mechanisms and remedies accessible to girls; ensure that justice systems are accessible and do not discriminate and re-victimize girls. The annual report of the Special Representative of the Secretary-General for Children and Armed Conflict to the United Nations General Assembly (A/70/162 paragraph 17 ) formally supports the Global Study on Children Deprived of Liberty and expresses her office’s availability to contribute thereto. The annual report of the Special Representative of the Secretary-General on Violence against Children to the United Nations General Assembly (A/70/289 paragraphs 3/25, 121.d) also supports the Global Study on Children Deprived of Liberty. The report of the Special Rapporteur on torture and other cruel, inhuman or degrading treatment or punishment to the Human Rights Council (A/HRC/28/68, paragraph 68) specifically focused on children deprived of liberty, addressing children in conflict with the law, children in institutions, Children in administrative immigration detention institutions. Furthermore, the report explicitly welcomes the commission of a Global Study on Children Deprived of Liberty and the appointment of an independent expert to lead it. The annual report of the Special Representative of the Secretary-General on Violence against Children to the Human Rights Council (A /HRC/28/55 paragraph 139), expressed her office’s full commitment to contributing to the Study’s development, underscoring that the Study will provide a strategic opportunity to prevent girls’ deprivation of liberty, and associated risks of stigmatization and violence; safeguard girls’ rights as victims, witnesses and alleged perpetrators; and promote their long-lasting recovery and reintegration. The annual report of the Special Representative of the Secretary-General for Children and Armed Conflict (A/HRC/28/54, paragraph 30) reiterates the office’s support and cooperation to the Global Study on Children Deprived of Liberty. Defence for Children International (DCI) and Human Rights Watch also participated in the Thirteenth United Nations Congress on Crime Prevention and Criminal Justice (12-19 April 2015, Doha), organizing a specific event on “The Global Study on Children Deprived of Liberty” together with the United Nations Office on Drugs and Crime, to lobby support and also to ensure the Study was explicitly mentioned in the final outcome document of the Congress, the Doha Declaration (A/CONF.222/L.6, paragraph 5.e). 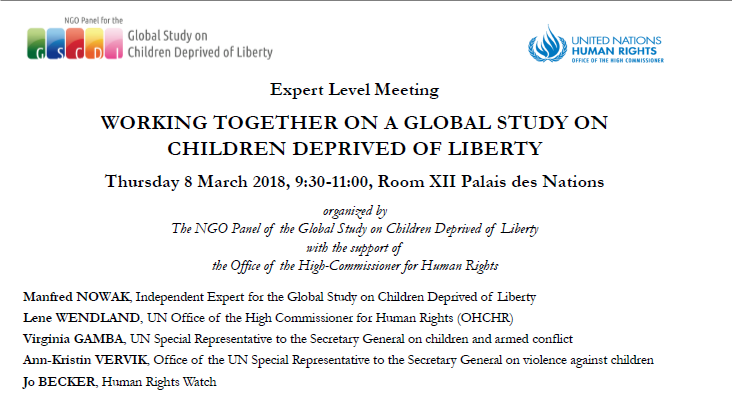 During the 28th regular session of the United Nations Human Rights Council, the NGO Panel for the Global Study on Children Deprived of Liberty organized a side-event “Children Deprived of Liberty, a global perspective” (10 March 2015). The event was supported by the Permanent Missions of Switzerland, Norway, Qatar and Uruguay to the United Nations in Geneva. Key speakers included the United Nations Special Representatives to the Secretary General on Violence against Children and on Children and Armed Conflicts, and the United Nations Special Rapporteur on Torture. The aim of the event was to keep the Global Study on the United Nation’s agenda as they decide how and who will lead its realization. You can view the webcast online and the full report of the event here . Defence for Children International (DCI), actively participated in the World Congress on Juvenile Justice (26-30 January 2015), with a specific presentation on the Global Study on Children Deprived of Liberty and DCI also acted as key note speaker in the concluding remarks of the Congress. In addition, DCI lobbied to ensure the Global Study on Children Deprived of Liberty was included in the final declaration of the Congress (paragraph 17). The former Independent Expert for the United Nations Study on Violence (2006), Professor Paulo Pinheiro, sent an official letter to the United Nations Secretary General supporting the Global Study on Children Deprived of Liberty and the appointment of an Independent Expert to guide its implementation. Six former chairpersons of the United Nations Committee on the Rights of the Child also made a public statementsupporting the Study and the appointment of an Expert. The United Nations General Assembly officially requested the Global Study on Children Deprived of Liberty to be carried out through its Resolution on the Rights of the Child (A/RES/69/157 paragraph 51.d), marking the success of the campaign led by the NGO Panel for the Global Study on Children Deprived of Liberty and the concrete advancement of the Study’s realization. Official letter addressed to the United Nations Secretary-General, Ban Ki-Moon, to urge the appointment of an Independent Expert to lead the Study, in order to ensure a comprehensive & collaborative approach. The United Nations Special Rapporteur on Torture, Professor Juan Mendez, also made an official statement to this end. 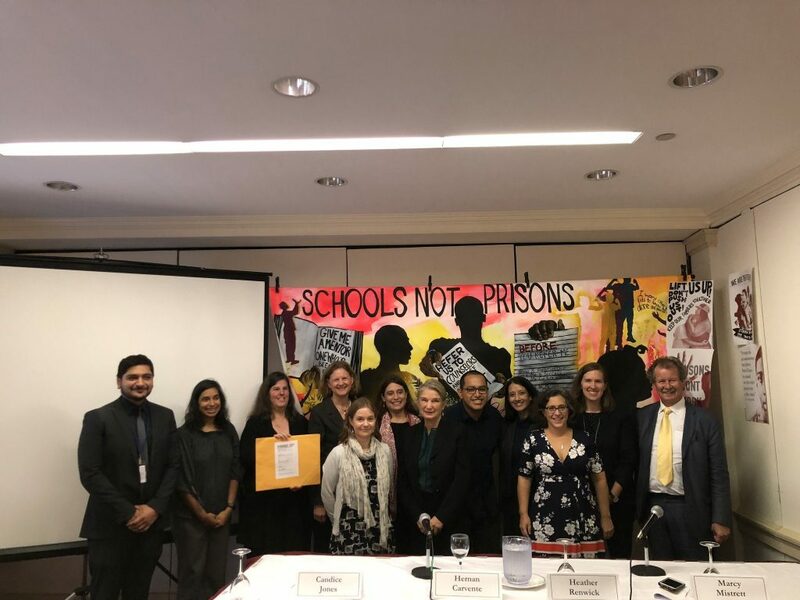 Defence for Children International (DCI) and Human Rights Watch, as co-convenors of the NGO Panel for the Study, organized a high level event in New York. The panel discussion underlined the lack of data on children deprived of liberty and the need to appoint an Independent Expert to lead the Global Study on Children Deprived of Liberty. This event took place in parallel to the negotiations around the United Nations General Assembly Resolution on the Rights of the Child. 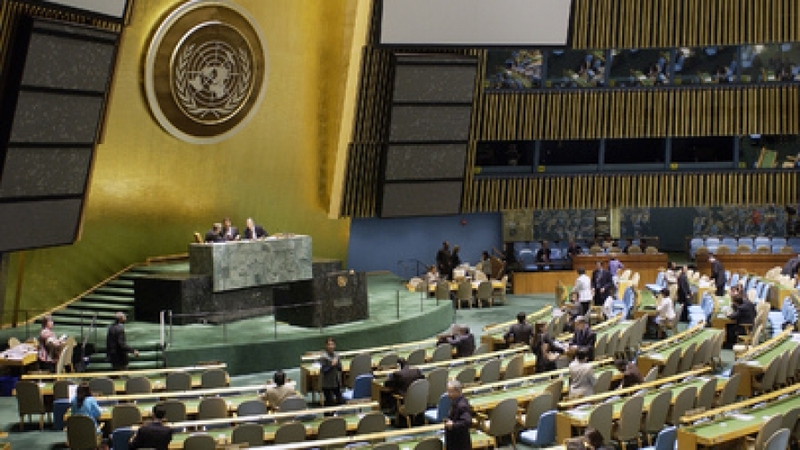 DCI and Human Rights Watch lobbied Permanent Missions to the United Nations in New York to ensure the text of the resolution would include a formal request for the Study. In addition, DCI on behalf of the NGO Panel, made a press release to support its lobbying efforts around the text of the United Nations General Assembly Resolution on the Rights of the Child, as the explicit reference to Independent Expert was removed. Defence for Children International (DCI), on behalf of the NGO Panel for the Global Study on Children Deprived of Liberty, delivered an oral statement on the occasion of the 27thregular session of the United Nations Human Rights Council, during the panel discussion on the protection of the human rights of persons deprived of their liberty (10 September 2016), calling on the members of the Human Rights Council (HRC) to support the launch and execution of the Global Study on Children Deprived of Liberty. The Parliamentary Assembly of the Council of Europe (PACE) adopted a Juvenile Justice Resolution(No. 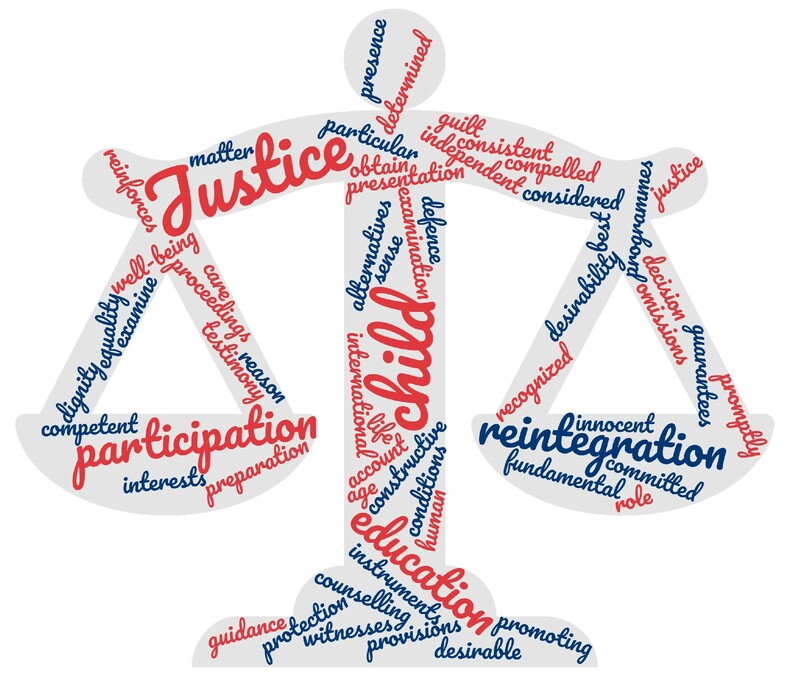 2010/2014, paragraph 7), urging member States to adopt child-centred, specialized juvenile justice systems and explicitly supporting the Global Study on Children Deprived of Liberty. Defence for Children International (DCI) as lead for the NGO Panel, organized an Expert Consultation at the Palais des Nations in Geneva (13 June 2014), involving UN experts and agencies, member States, academia and civil society to discuss eventual implementation, including methodology, for the realization of the Study. The full report of the Expert Consultation, which includes important examples and ideas from a variety of key actors, is available. 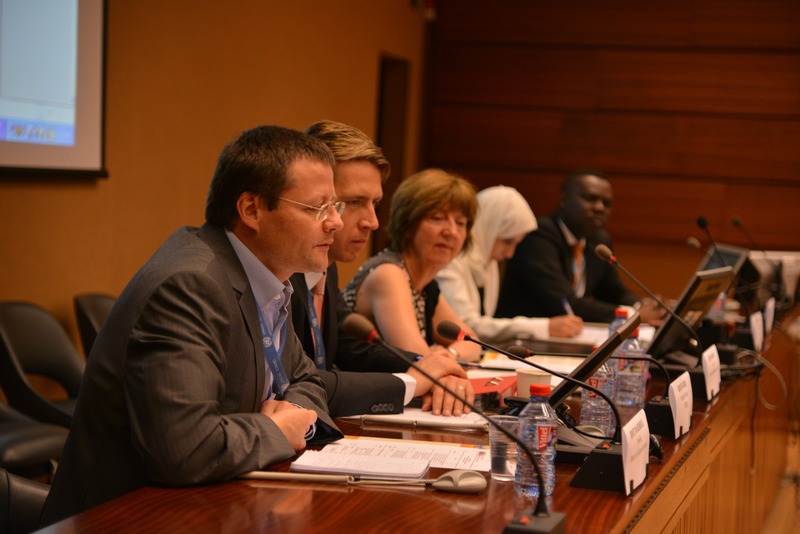 A side-event on “Strategies for Reforms in Juvenile Justice”, supported by the Permanent Missions of Switzerland and Austria to the United Nations in Geneva, was organized on the same day by the Interagency Panel on Juvenile Justice. Defence for Children International (DCI), on behalf of the NGO Panel for the Global Study on Children Deprived of Liberty, delivered an oral statement on the occasion of the 26thregular session of the United Nations Human Rights Council, under Item 3, Interactive Dialogue with the United Nations Special Rapporteur on Right to Health (11 June 2014), underlining the increased risks of abuse children deprived of liberty are exposed to. An official letter of recommendation by the United Nations Committee on the Rights of the Child, and a letter by NGOs formally requesting the Study to be carried out and the appointment of an Independent Expert, were both sent to the United Nations Secretary General (UNSG), Ban Ki-Moon. After six months of drafting and defining a concept note for the campaign, Defence for Children International (DCI) and other partner NGOs (now formalized as the “NGO Panel for the Global Study on Children Deprived of Liberty”), organized an official launch of the campaign calling for a Global Study on Children Deprived of Liberty at the Palais des Nations in Geneva, on the Annual Day on the Rights of the Child of the United Nations Human Rights Council (13 March 2014). The event included the participation of Ms. Marta Santos País (United Nations Special Representative to the Secretary General on Violence against Children), Justice Renate Winter (Member of the United Nations Committee on the Rights of the Child) and supporting Permanent Missions of Uruguay, Qatar, Austria and Ethiopia to the United Nations in Geneva. The NGO Panel also prepared a Q&A for member States and an Advocacy Brochureto support its lobbying activities. Also in March 2014, the European Network of Ombudspersons for Children (ENOC) formally supported the Global Study on Children Deprived of Liberty through an official statement. The call is also available in French, Spanish, Arabic, Russian, Italian and Portuguese.